A project survey is the set of single or multiple choice questions teams answer to describe a project’s risk profile or business context. The questions, how they are structured, and the way answers relate to each other can be managed by content administrators. The answers to a survey are the project settings. Certain tasks and how-to’s become relevant to a project based on its settings. When a project is created, a list of tasks are included based on the profile and its initial survey answers. Project settings can be edited multiple times. If a team is unsure about certain answers, they can return to change the project settings at a later time. Once the settings are finalized, a project lead can lock the survey so that no further changes can be made. SD Elements provides the following categories for project settings by default. Your administrators may have defined additional custom categories and subcategories unique to your environment. Application General: High-level settings about the application, such as the type of application and its protocols. Language and Platform: Technology-specific settings about the application, such as the programming language and third party libraries used. Features and Functions: Security and other related features, such as whether or not the application allows users to upload files. Compliance Requirements: Requirements from specific regulatory bodies, such as the Payment Card Industry (PCI). Development/Test Tools: A list of tools that may be used during development or testing. These settings help SD Elements determine which technology-specific How-To’s it can provide. For example, some How-To’s require the use of Open Web Application Security Project (OWASP) tools: these How-To’s will only appear if you are allowed to use OWASP tools. Changes Since Last Release: Settings that determine what the changes were since the last release. Only use this section if you wish to model the changes between releases rather than the entire application. This section does not appear by default. It will only appear if you create a new release of a project. To update a project survey, follow the steps below. The user has the permission Project role→Project Management→Edit project survey. Open the project tasks for the project. On the top-right of the project tasks list, click the more_vert icon. Select edit survey from the dropdown menu. The answers to the project survey are updated. The task list is updated according to the new answers. Any pending task list changes prior to the survey update are applied to the project as well. To lock a project survey so that no further changes can be made, follow the steps below. The user has the permission Project role→Project Management→Lock project survey. 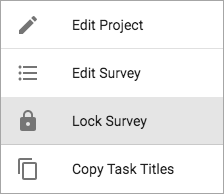 Select lock survey from the dropdown menu. No further changes can be made to the project settings without unlocking the survey. Changes to the project task list may still be made through Project content updates. To unlock a project survey so that changes can be made, follow the steps below. 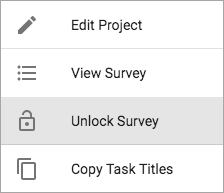 Select unlock survey from the dropdown menu. Changes can now be made to the project survey. Completing the project survey determines the phases of the software development lifecycle (SDLC) that are visible or hidden in your project, and the number of tasks associated with those phases. The number of tasks appears next to the phase, and as long as there is one task available for that phase (as determined by the project survey), that phase will be visible. Phases with zero tasks (as determined by the project survey) are hidden. In the project below, the phases ARCHITECTURE & DESIGN and TESTING have zero tasks, but they remain visible. However, DEPLOYMENT is hidden. Completion of the project survey determines the tasks that are allocated into specific phases. If the survey allocates at least one task into a phase, then that phase will be visible. A phase may indicate that zero tasks are available based on checking the risk policy box, searching, or filtering. 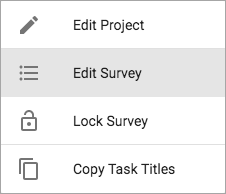 If you add a project specific task or a manually added library task to your project, the default phases determined by the project survey will change accordingly by making a previously hidden phase visible. At the same time, if you remove a task from a phase to bring the task count to zero, that phase will become hidden. The Task Completion widget also becomes visible or hidden based on the number of tasks in a phase. Generally, whenever tasks are included in a project, the widget is displayed on the project overview page. 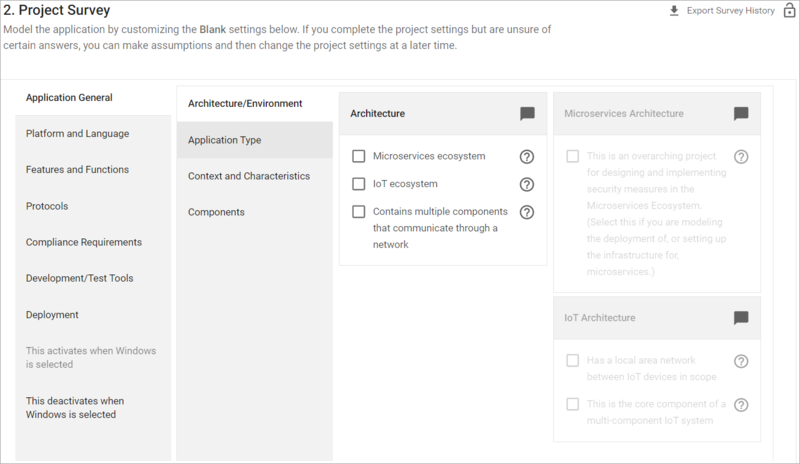 However, when the project survey is incomplete, empty, or there are no tasks for the project (as determined by a risk policy, for instance), the Task Completion widget is hidden from the project overview. Note that the widget will display a phase regardless of the status of tasks within it, but the number of tasks will only include tasks with a status of &apos;Complete&apos; and &apos;Incomplete&apos;, and not &apos;NA&apos;.